This article presents a set of paradigms—that is, conjugation tables—of Spanish verbs, including examples of regular verbs and some of the most common irregular verbs. For other irregular verbs and their common patterns, see the article on Spanish irregular verbs. The tables include only the "simple" tenses (that is, those formed with a single word), and not the "compound" tenses (those formed with an auxiliary verb plus a non-finite form of the main verb), such as the progressive, perfect, and passive voice. The progressive aspects (also called "continuous tenses") are formed by using the appropriate tense of estar + gerund, and the perfect constructions are formed by using the appropriate tense of haber + past participle. When the past participle is used in this way, it invariably ends with -o. In contrast, when the participle is used as an adjective, it agrees in gender and number with the noun modified. And similarly, the participle agrees with the subject when it is used with ser to form the "true" (dynamic) passive voice (e.g. La carta fue escrita ayer 'The letter was written [got written] yesterday. 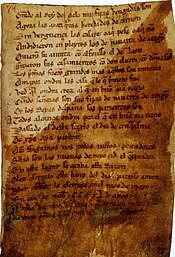 '), and also when it is used with estar to form a "passive of result", or stative passive (as in La carta ya está escrita 'The letter is already written.'). The pronouns yo, tú, vos, él, nosotros, vosotros and ellos are used to symbolise the three persons and two numbers. Note, however, that Spanish is a pro-drop language, and so it is the norm to omit subject pronouns when not needed for contrast or emphasis. Note also that the subject, if specified, can easily be something other than these pronouns. For example, él, ella, or usted can be replaced by a noun phrase, or the verb can appear with impersonal se and no subject (e.g. Aquí se vive bien, 'One lives well here'). The first-person plural expressions nosotros, nosotras, tú y yo, or él y yo can be replaced by a noun phrase that includes the speaker (e.g. Los estudiantes tenemos hambre, 'We students are hungry'). The same comments hold for vosotros and ellos. Sometimes referred to by Spanish instructors as a "Yo -go" verb. ^ a b c d e f g h i j k l m n o p q r s t u v w x y z aa ab The pronoun vos and its verb forms are used in large areas of Central and South America for the second-person singular in the "familiar" or informal register, generally replacing (but in some areas coexisting with) tú. In Argentina, Uruguay and Paraguay it is used in the formal register (but the familiar or T form of address). See Voseo. ^ a b c d e f g h i j k l m n o p q r s t u v w x y z aa ab The second-person plural familiar pronoun vosotros / vosotras is used only in Spain; in the Americas its function is carried by ustedes. ^ a b c d e f g h i All of the normative preterite forms for use with tú end with -ste. Colloquially, speakers frequently add a final -s to this form, thus (tú) amastes, temistes, partistes, etc. ^ a b c d e f g h i The preterite endings -stes and -ste are both in widespread use with vos — thus (vos) amastes and (vos) amaste, (vos) temistes and (vos) temiste, etc. The ending -stes is historically the original form used with vos. Normatively only the -ste forms are accepted. See amar in the Dictionary of the Spanish Royal Academy. ^ a b c d e f g h i j k l m n The original present subjunctive form for vos has final stress, with an accent mark: amés, temás, partás, etc. In Rioplatense Spanish, these forms exist side by side with forms identical to the normative forms for tú (stress on the second-to-last syllable, no accent mark: ames, temas, partas, etc.). The normative form for vos is the one used in Rioplatense Spanish: see amar in the Dictionary of the Spanish Royal Academy. ^ a b c d e f g h i Given the respective geographical distributions of the imperfect subjunctive in -se (mostly Spain) and the use of voseo (only in the Americas), it is extremely unlikely that forms such as (vos) amases, (vos) tuvieses, etc. would occur. ^ a b c d e f g h i The future subjunctive is obsolete in Spanish, except for legal language, highly literary language, or fossilized expressions like sea lo que fuere 'be what it may, whatever it may be'. ^ a b c d e f g h i Given the "high" register of the future subjunctive in contrast to the informality of tú and vos, it is extremely unlikely that forms such as amares, tuvieres, etc. would occur in Modern Spanish prose or conversation. ^ a b c d e f g For every verb, the normative command form for vosotros ends with -d (amad, temed, partid, etc. ), but the colloquial form ends with -r, making it identical to the infinitive (amar, temer, partir, etc.). When the object pronoun os is attached to make the corresponding reflexive forms (also called a "pronominal" verb), the -d is dropped, but the -r is not. Thus amad > amaos (normative) and amar > amaros (non-normative), etc. ^ Estar is often made pronominal in the imperative, especially in colloquial speech. ^ The usual conversational form is estar, which is not normative. For the pronominal estarse, the forms estaros and also estarse for some regions (instead of estaos) are not normative, but they are used in colloquial speech. The form estad is only used formally. ^ The form is ha to construct the perfective tenses and in haber de, but hay in the impersonal expressions hay que and hay meaning "there is/are". ^ The form is habemos in the rare expression nos las habemos con, meaning 'the matter in question is'; dialectally or archaically habemos may replace hemos, in all senses; and dialectally it may replace hay in the plural, meaning "there are". ^ Hubieron is commonly used by Spanish speakers as a replacement for hubo in the plural form, as in Hubieron muchas cajas, with the connotated translation of "There were many boxes", although this usage of hubieron is not normative. ^ Dialectally, ves. Not used pronominally, always vete. ^ The verb ir, for its affirmative imperative with vos, borrows the form from andar ('to walk/to go'). ^ Usage in Central America favors the regular form "í". ^ The form ir (instead of id) is not normative, but it is the one used in colloquial speech. The normative second-person plural imperative of the pronominal verb irse is idos (i.e. it does not lose its d as other verbs do), but it is virtually unused, either spoken or written. The form íos is obsolete. The non-normative forms used in colloquial speech are iros or regionally irse. To avoid using these forms, some writers simply use a different verb, i.e. marchaos. Espagram: verb conjugator Spanish verb conjugator. Contains about a million of verb forms. This page was last edited on 16 January 2019, at 18:50 (UTC).